Why Has My Cat Stopped Using The Litter Box? My cat is peeing in my laundry basket. Is she mad at me? No! When a cat urinates in locations other than the litter box, a common misconception is that she is doing it vindictively. However, while your cat isn’t doing this out of spite, she may be trying to tell you something. She could have a medical problem, such as a urinary tract infection or bladder stone. Or, there may be something about the litter box she doesn’t like or she may have anxiety problem requiring medical management. It is important to address the problem quickly. the longer it goes unmanaged, the more likely it is to become a habit, and the more difficult it can be to correct. The first step is to see your veterinarian for an exam and diagnostic tests to rule out a medical cause for the house soiling. 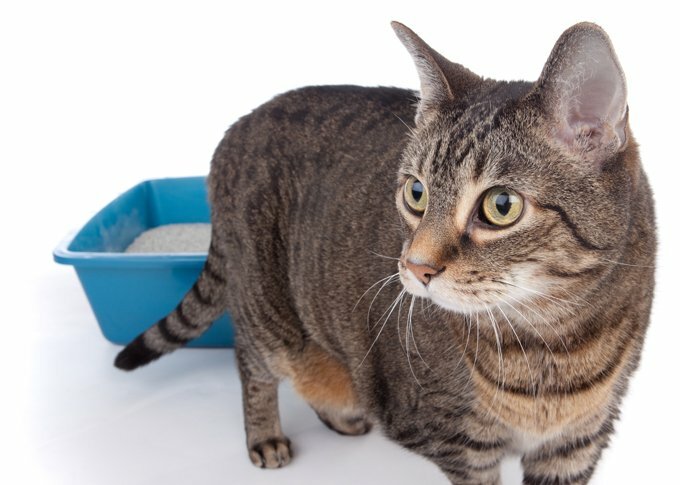 If the results are normal, then try to determine, with the help of your veterinarian or a behaviorist, if there is any pattern to the “accidents.” Distinguishing between a litter box aversion and a behavior problem helps determine if you should focus on improving her “toilet” area versus anxiety reduction and medication. What type of surface does your cat prefer for elimination? What locations in your home are affected? How many other pets are in the home, and do your pets get along with each other? How many litter boxes are in the home, and where are they located? How often do you clean the box, and what cleaning products are used? Have you changed the type of litter or changed the box in any way? Have there been any other changes at home that might cause your cat distress?